Dunton Hot Springs has brought a historic Colorado mining town back to life in the form of a luxury resort retreat. In the last two years alone, Dunton Hot Springs has been rated #12 in the Top 40 Resorts in the West in the Conde Nast Traveler Reader’s Choice Awards, #4 Best Food Lovers Hotel in America by Bon Appetit, #1 All-Inclusive Resort in the USA, #4 All-Inclusive in the World by Tripadvisor’s Travelers’ Choice Award, and the Tripadvisor Award of Excellence. The luxuriously refurbished mining cabins offer unparalleled comfort and an authentic Western experience. The five-star kitchen creates a new menu everyday from local and regional ingredients, including many from their farm and vineyard. Meals are served at a communal, antique table in the center of the Saloon and the open kitchen format allows guests to even participate in the cooking with the Chef as she makes the days fare. 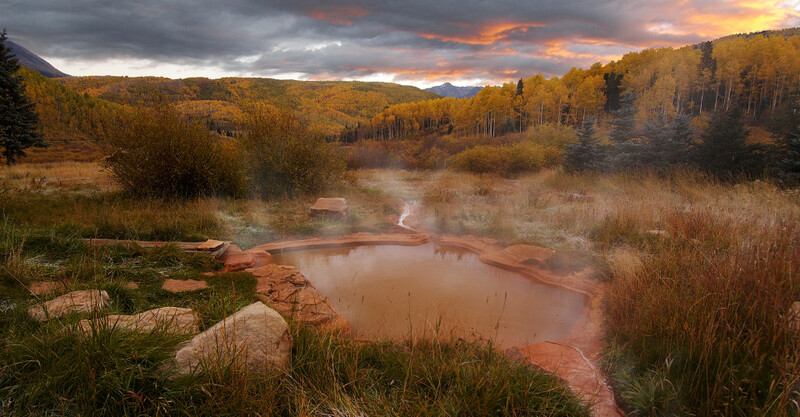 This small luxury resort outside of Telluride offers natural hot springs, pampering massages, fly fishing, helicopter skiing pick up, horseback riding, and much more. Hike a 14,000 foot peak with an expert guide or try mountain biking on the many nearby trails; enjoy a day trip to nearby Mesa Verde National Park to get a taste of ancient Native American life at the many ruins. Finally, at the end of a busy day of outdoor activity, relax with a beautiful glass of wine and fabulous dinner. Dunton offers wedding and group packages, including corporate events.